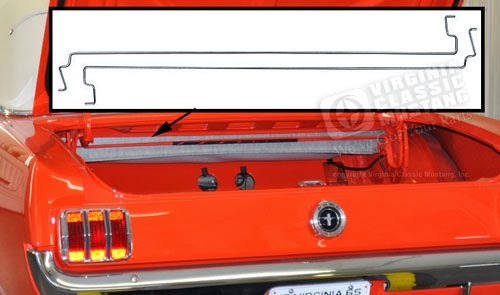 Virginia Classic Mustang Blog: 1965 and 1966 Mustang Coupe and Convertible Trunk Lid Torsion Rod Set - New Part! 1965 and 1966 Mustang Coupe and Convertible Trunk Lid Torsion Rod Set - New Part! We now have the torsion rods that hold up the trunk lid on the 65-66 Mustang Coupe and Convertible. These rods kind of act like springs in holding the weight of the trunk lid so it stays in an upright position when open. Order part number SM-9101. We also have the rubber sleeve for these (part number WS-24). It mounts on one of the rods to keep metal to metal from rubbing together.